Earning points and miles through flying on planes, staying in hotels, and credit card spend are all ways to rack up points. But in addition to those methods, most major loyalty programs allow you to buy points directly from the airline or hotel chain. Here’s our guide on the ins and outs of buying points and miles. The absolute best time to buy points and miles is when there’s a sale. Lately, American Airlines has been offering promotions very consistently while Delta, United, IHG, and others offer them less frequently. With these sales, the prices don’t go down, but rather you get bonus miles with your purchase. The bonuses are usually tiered depending on the number of miles you’re purchasing, so the more you buy, the bigger the bonus. The key to maximizing the sale is to buy enough points to get the highest bonus possible. Currently, United is offering a sale through January 23. If you buy 5,000-24,000 miles, you’ll get a 25% bonus, and if buy 25,000-100,000 miles, you’ll get a 50% bonus. 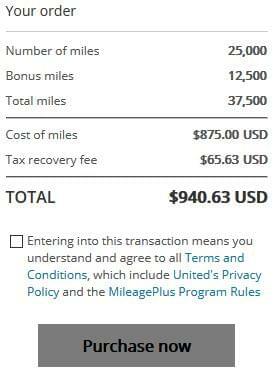 If you buy exactly 25,000 miles to get the 50% bonus, you end up with 37,500 miles for a cost of $940.63 after tax. At this rate, you’re buying miles at about 2.5 cents each ($940.63/37,500 miles). Buying miles is a great way to pad your loyalty balances for an upcoming redemption. And when the airlines and hotels offer deep discounts, you can often get great deals. Bear in mind when you buy miles that it can take a few days for them to post to your account. Also, there’s typically a cap to the number of miles or points you can buy with each program each year. A good rule of thumb is to only buy points or miles with a specific redemption in mind. While it may be hard to pass up a great sale, loyalty programs are constantly devaluing, so even with the deal, it’s generally not a good idea to buy miles speculatively. Let’s take a closer look at United’s current promotion mentioned above where miles cost roughly 2.5 cents each. While this is a discount, it’s not a great deal. A 25,000-mile saver roundtrip ticket would cost you $627 ($0.025 X 25,000 miles). That’s pricey for a domestic ticket! What about topping off your balance for an award? 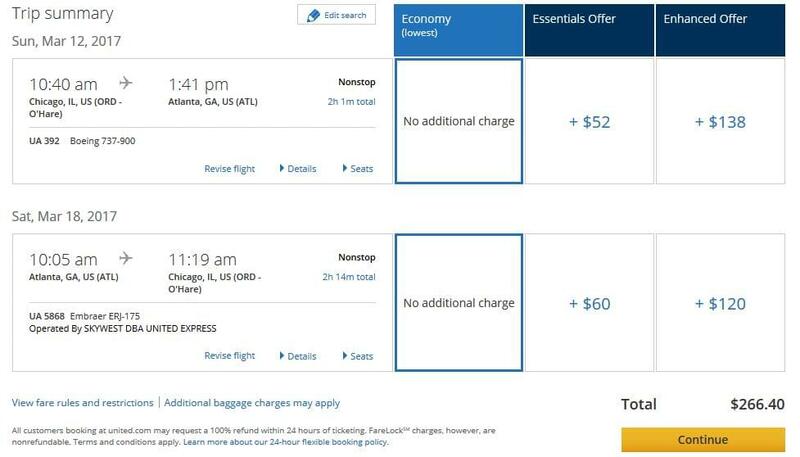 Suppose you’re planning a trip from Chicago to Atlanta in March and found saver award availability (25,000 miles roundtrip) on the dates you need, but you only have 21,000 miles. If you purchase miles using the current sale and maximize the bonus, the miles you need will cost you $103 ($0.025 X 4,000). Meanwhile, the regular cash price of this ticket is about $266. Sure, you’re technically saving money on the total cost of the ticket, but that means those 21,000 miles you already had are only worth $163. Considering the cost, you should probably pay for this ticket outright if you’re trying to maximize the value of your existing miles. However, if you plan to redeem miles at this cost for an international premium cabin, you may get a higher value and come out ahead. 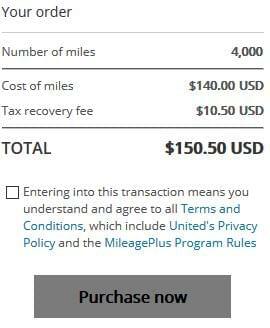 The idea when buying miles is to look at the redemption value compared to the purchase value. Also, keep in mind that the bonuses offered with these promos tend to vary. If a sale doesn’t seem that great, another might come along, so it could be beneficial to wait. However, it’s hard to predict when these sales will occur, and it’s always possible another devaluation could come along first (where you’d need to buy even more miles than you would have originally). Should I Ever Buy at Regular Price? Every person’s travel habits are different, so I can’t definitively say that you should never buy points when they’re not on sale. Going back to our earlier United example, let’s say you only needed 4,000 extra points for your award ticket. The non-sale cost would be $150.50. You’re buying miles at a rate of 3.76 cents each. If you truly don’t have enough money for the $267 ticket, but you can afford $150.50, then absolutely go for it. They’re your miles, after all, and if you can get value out of them, that’s what it’s all about. When you do decide to buy miles, make sure you’re using the right credit card. Most purchases are processed through points.com (as opposed to directly with the airline or hotel chain), so you’ll earn the standard 1 point or mile per dollar on this purchase. This is a good way to knock out some spend if you’re working on a signup bonus. However, some programs process the deal directly which will code as an airfare or a hotel purchase. Before you finalize your purchase, look at the address bar in your browser. If you’re at points.com, you’ll know this will not count as an airfare or a hotel purchase. But if you aren’t at points.com, use a credit card that has a category bonus to earn even more points on the purchase. A word of caution when it comes to buying points from other sources. There are online brokers that will sell you points, often cheaper than what the airlines and hotel programs are offering. While the brokers may be legitimate, it’s usually against the terms and conditions of loyalty programs to buy points from 3rd parties or if you pay someone for their miles, and they book the award for you. Doing so can lead to your loyalty account being shut down and the forfeiture of your points. It’s not worth the risk, so stay away from this practice. Buying points and miles is the easiest way to accumulate them, but it can also be the costliest way to build up your loyalty balances. Always consider the cost of buying points compared to the redemption value to make sure you’re getting a good deal.